I am beautiful. Just the way I am. Period. For me, it’s too easy to see the unfinished business that is Myndi. The broken parts of me that are struggling to grow into something more easily recognizable as beautiful. Oh my goodness – my temper? It’s an ugly thing. My self-centeredness? It can oftentimes be masked, but it’s always there, lurking. And as far as body image goes, the list of things that could be considered un-lovely is lengthy. Extra weight. Wide feet. Stretch marks. That’s just a few. But here’s the thing. None of us are any one thing. None of us are made up solely of those few seemingly undesirable things that pop out at us in the mirror, or shout at us in our psyche. We are the sum of all our parts, good and bad. Pretty and otherwise. Yes, I have a temper. But I’m always ready to laugh. Yes, I can be self-centered. But if someone needs an ear, I’m always ready to listen. And I may carry extra weight, have feet that can’t be crammed into the prettiest shoes, and stretch marks from bearing children, but I also have strong legs that have never failed me, happy eyes that can’t decide if they’re green or blue, and health that I’ve never had to question or fight for. Among all I lack, there is so much beauty. Not just in me, but in each and every one of us. We are beautiful. That is absolutely true, no matter how our brains filter what we see in the mirror. You are beautiful. Just as you are. Just the way God made you. With your extra weight. With the weight you need to gain. With your thinning hair. With your gorgeous locks. With your extra chromosome. With your missing limbs. With your beautiful tattoos. With the tattoos you wish you’d never gotten. With a total mastectomy. With your breast implants. No matter where you are in life, how you were born, what you’re like now, where you’re headed – you are beautiful. Acne or clear skin, hairy legs or freshly waxed, crooked teeth or straight. You are beautiful. Just the way you are. Right now, in this moment. I think it’s time we claim it. Grab ahold of the idea, clutch it tightly to our chests, and declare, “This is mine! My own! 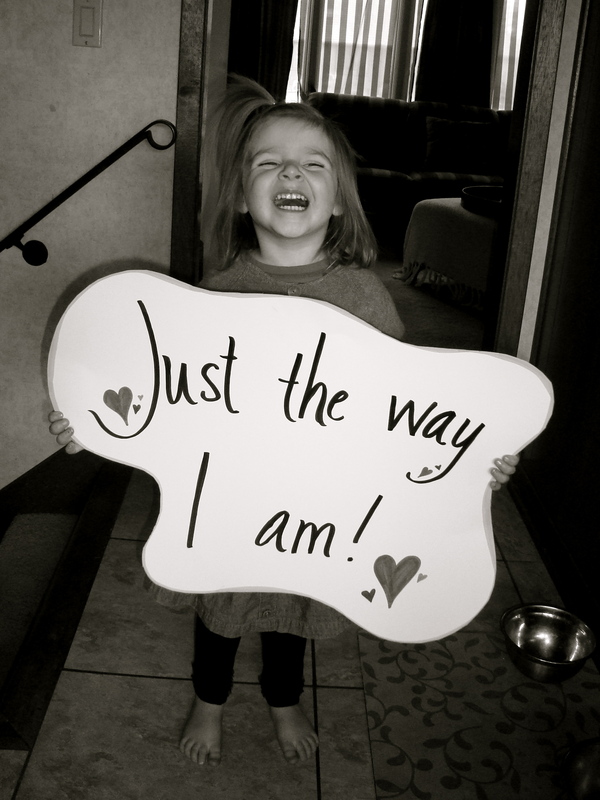 I am beautiful!” We need to write the truth of that statement on our hearts, and believe it. Because when we believe in our own beauty – real beauty, beauty that springs from the deep places within ourselves – something in us changes. It becomes easier to see beauty in others. It becomes easier to see beauty in people we wouldn’t have taken much notice of before. Suddenly the cashier at the grocery store is more than a woman in a red vest telling us what our total is. She’s a work of art with hopes and dreams and wounds and hurts…a complete, broken, beautiful package, who, chances are, has no clue about the Truth, or Worth, of her own beauty. Suddenly the woman walking her dog in front of your house isn’t just a middle-aged stranger trying to get some fresh air before making dinner. She’s a work of art with hopes and dreams and wounds and hurts…a complete, broken, beautiful package, who, chances are, has no clue about the Truth, or Worth, of her own beauty. I believe beauty can be contagious. I believe that when we own up to ours, our shoulders will straighten, we’ll look people more readily in the eye, and other people will begin to see their own beauty reflected in us…and maybe begin to believe in their own beauty, as well. Isn’t that something you’d want to be a part of? Every month here at Blogging Barefoot, I’m going to do a segment called I Am Beautiful… Before each segment, I’ll put up a post, asking for photographs of you – gorgeous, beautiful you. Not just you, but the beautiful people that you know (with their permission, of course). Then, later that month, I’ll post those photographs for everybody to see – statements of beauty that aren’t designed by popular media or out-of-whack cultural values. In honor of August McLaughlin’s Beauty of a Woman BlogFest 2012 (August has a ridiculously fabulous blog – head over there on Friday, the 10th for a chance to win some AWESOME prizes, and to explore lots of other really excellent blogs! ), the theme for this month is Just As I Am. I’m asking you to send me photographs of you just as you are. Your daily self. Do you normally wear makeup and heels? Great – photograph it. Do you normally go about your daily life makeup-less and barefoot? (eek! That’s me!) Perfect – photograph it. I want to see photographs of you, as you are at your most normal. Don’t dress up; don’t dress down. Just be yourself. I had my boys take a couple pics of SweetZ and I to give you an idea. This is us, at our everyday best, in our everyday habitat. Feel free to get creative with your shots – or not! Just don’t be afraid of the camera, and don’t be afraid to shine! Send your pics to: myndishafer [at] rocketmail [dot] com, with Just As I Am in the subject line. Cut-off date for submissions is February 24! Spread the word…the more the merrier! Quick Giggle: All Lies, I Tell You! All LIES! Everything about it. The message. The words you chose. Those awesome pictures. The nifty signs. Everything. You and your daughter ARE beautiful. Just the way you are. You truly are beautiful Myndi, as is your daughter. There is greater beauty in potential than in perfection. What a beautiful post! You’ve gained a new follower right here. This…I agree with Gloria. Everything about this post is perfectly beautiful – the words you use and how you string them together, your message, your pictures. Wow. I LOVE this post. I’m going to follow you and star it in my Google Reader to read as a reminder when I’m feeling ugly – either physically or mentally or emotionally. Thank you. Love it Myndi!!! I believe everyone woman must revel in her own awesomeness. In awe of each of our spectacular beauty? Not the stuff from pictures or in the mirror but the inner beauty that shines through each of us and makes us all that we are – women, powerful and amazing and beautiful! Yes, it’s hard to do it every single day and every single moment when we get caught up in the business of life etc but it’s so important to take the time periodically to acknowledge and raise your glass to your “beauty”! Here here to you for reminding us and celebrating it! Woot woot! Hurray! Can’t wait to get your pic, Miss Natalie! Beautiful. All of this is truly beautiful – your words, the photos, the inspiration. When a woman finds herself headed for seventy in a couple of years, it becomes more difficult to “see” yourself as beautiful unless you have learned along the way that beauty comes first from within. This beauty becomes greater through your words and deeds. It’s a lesson that needs to be learned very early in life and you are doing a wonderful thing by promoting that message here, as is August on her fabulous blog. We all have flaws and recognizing them helps to make us more beautiful … that, and for me, mascara. Always mascara! LOL! I ❤ mascara, too! Love it, love it, LOVE IT! Go, Myndi! Go women! I have a particularly hard time with this. I tend to see my flaws and failings over any good that might be in me. This was a lovely reminder. That’s so cool! They say everybody’s got a twin right? How weird is it that it’s a mother/daughter twin combo… 🙂 I hope you’ll get them to send in pics!! None of us is any one thing… I love that! But how often I focused on my “imperfections” even though the beauty of who I am as a person outweighed any one thing?! Wow. Such a great way of looking at it. It’s about the big picture. The totality of who we are as human beings and as women. Great post! 1. You ladies need to quit buying 15 power makeup mirrors. Those things would make Sophia Loren (substitute your favorite current beauty queen) look ugly. 2. Remember that God created you in His own image and after His likeness and said that it was good. I had to grab a tissue! Gorgeous post, Myndi. The words embedded themselves in my mind and I’m going to repeat them every time I think I’m not beautiful. Part of the beauty of having kids is, if we’re really lucky, we can see ourselves through their eyes. Their pure, unconditional love of us is amazing. It’s taken a long time to get here, but each day I’m stronger in the belief that I AM beautiful, inside and out. Love you, Myndi!!! Wonderful post. REAL beauty is about embracing our REAL selves inside and out. I think that acceptance of who you are comes with age. I know I have room for improvement, but many quirky aspects of my personality define who I am. This is such an amazing message and post, Myndi! BRAVO! You are beautiful, just the way you are. *adorable pictures btw* I love finding women, and surrounding myself with them, who are so strong and beautiful – inside and out! I love your smiling faces, Myndi. 🙂 Happiness shines through in our smiles and shows the world that we love our life and ourselves. What could be more beautiful than that? Great idea on your monthly posts! Oh boy, do I ever gaze at the unfinished business that is me! I love how you put that:) But you are so right we need to celebrate our beauty, shout it from the rooftops, and recognize it in others. I love the idea the beauty can be contagious as well! Wonderful, wonderful post. Now, off to find a picture for your wonderful new series. And by the way, you look truly beautiful pregnant! Aw, thanks Kara! Can’t wait to see your pic! This is an amazing post. Your voice, your spirit, and your BEAUTY shined through the entire thing. And the idea for a series… absolutely wonderful! I have to go spread this post around. Every woman in the entire world needs to read this post. Every single one of them. Beautifully written, Myndi! Thanks, August! Can’t wait to get your pic!! Truly inspiring Myndi! I really love it. You are beautiful, inside and out. You did an awesome job. I can feel that it came from the heart. That gives it great power. Thank you for sharing! Myndi, you ARE so fabulous and I adore your little girl. The blogs are rocking today – I LOVE this post – and Debra said it all! You got me all teary… and I’m at work! LOL… love this! Absolutely beautiful and true, every, single, word. So glad I found your blog when I did so I didn’t miss this! Wow Myndi! This post is beyond incredible! Those photos – you and your daughter are indeed beautiful, and SO ARE WE! So empowering. Thank you for sharing this. I’m going to the grocery store later, and I intend to reflect the beauty of the cashier right back to her (or him). I love August’s idea of the “Beautiful” blogfest. I’ve been hopping between the participating blogs today and each post is amazing. I feel so privileged to know so many of you, beautiful women. Myndi, you are totally awesome – inspiring, funny, smart, and totally beautiful in and out. I love this post, Myndi. you and your daughter look like the happiest people around. I will try for a picture. Just have to get someone to take it. great idea for a blog series. I love how you embrace the bad with the good. We are all a happy mix of both and the sooner we realize it and accept that it’s part of who we are, the better. What a nice way to remind us to look for the good things that off-set the bad. Make lemonade out of lemons so to speak. You are beautiful, Myndi and you have a beautiful mini me! Keep up the positive thoughts. You’re so right, Myndi. You’re beautiful–and wise. I love that picture of you, Myndi. You looks so happy and pregnant. Your daughter’s a cutie pie too. 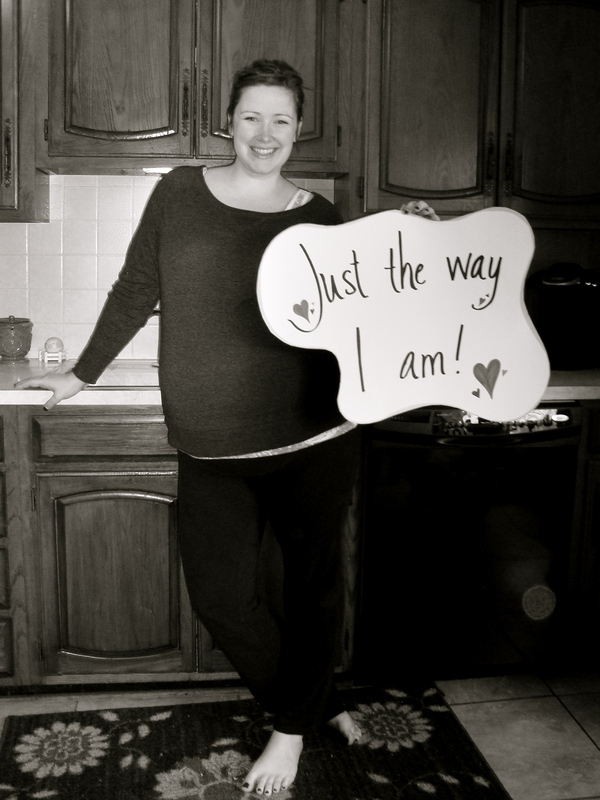 What a wonderful idea about the “Just as I am” photos. I’m inspired! Myndi, I loved the signs. I am inspired to make one of my own. Maybe you’ll see it on my blog someday. I LOVE your writing…your thinking…your outlook…your heart…. Great “I am beautiful” stuff! Am sending my pic and will look forward to more reading your wonderful blog. Thanks for the smile you placed inside me today. I love your post. Your words are beautiful and it’s clear that you’re sincere and it comes across. Very uplifting, Myndi. Thank you. I agree with you that when we accept that we are beautiful the way we are and find peace, we’re much more generous in sharing a smile with a stranger, with others, and some of them need a smile, some small act of kindness to give them a bit of hope when they’re dealing with difficult times. I agree that beauty is contagious, and your words in this post convey that message in a sweet and gentle way. Well done, Myndi! And those picks of you and your daughter – Awesome and darling!